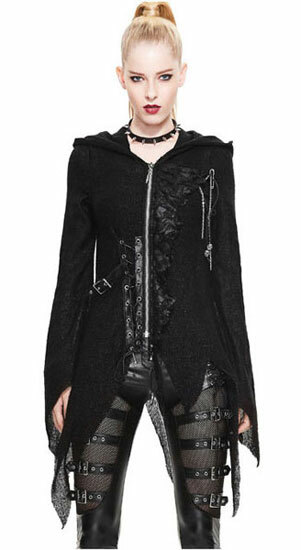 The Malika is a sheer hoodie with a long styled hood. The front zips up and has strap and buckle with grommet and lace details on the side. More of a throw than a hoodie but it's definitely warm. Wind will go right through it. The sleeves and armpits have enough space for a fitted long sleeve shirt underneath. It's super soft but I'm afraid the buckles on my wristbands will snag it. Sizing: My bust is 32-34 and my hips are 30-32. I wear a small hoodie in men's and a large in women's. I went with a large and it fits perfectly. Material: 100% polyester; no static when trying it on. IMHO hand wash lay flat to dry so it won't snag on the agitator. You might be safe with a front loader.